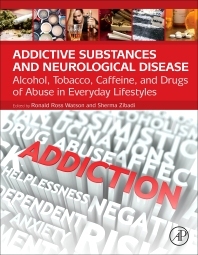 Addictive Substances and Neurological Disease: Alcohol, Tobacco, Caffeine, and Drugs of Abuse in Everyday Lifestyles is a complete guide to the manifold effects of addictive substances on the brain, providing readers with the latest developing research on how these substances are implicated in neurological development and dysfunction. Cannabis, cocaine, and other illicit drugs can have substantial negative effects on the structure and functioning of the brain. However, other common habituating and addictive substances often used as part of an individual’s lifestyle, i.e., alcohol, tobacco, caffeine, painkillers can also compromise brain health and effect or accentuate neurological disease. This book provides broad coverage of the effects of addictive substances on the brain, beginning with an overview of how the substances lead to dysfunction before examining each substance in depth. It discusses the pathology of addiction, the structural damage resulting from abuse of various substances, and covers the neurobiological, neurodegenerative, behavioral, and cognitive implications of use across the lifespan, from prenatal exposure, to adolescence and old age. This book aids researchers seeking an understanding of the neurological changes that these substances induce, and is also extremely useful for those seeking potential treatments and therapies for individuals suffering from chronic abuse of these substances.